This year teams will compete for top honors in two categories - Small Team and Large Team divisions. For both divisions: All scores will be used and averaged for a total team score. Equal weight to each person's score. Each team competitor must complete all three stages of the main match. Incomplete scores will be dropped. Side matches are not part of the team competition. Put together your team and choose a team name. At the event there will be a team sign in sheet. Find your team and add your name or if you are the first on your team simply add your team. All competitors must declare the team they are shooting for PRIOR to shooting. Competitors may participate on more than one team if they shoot more than once and declare which team they are shooting for PRIOR to shooting. All team participants will also be included in the Individual competition without having to shoot specifically as an individual. The 2016 Toys for Tots match was held 17-19 November. 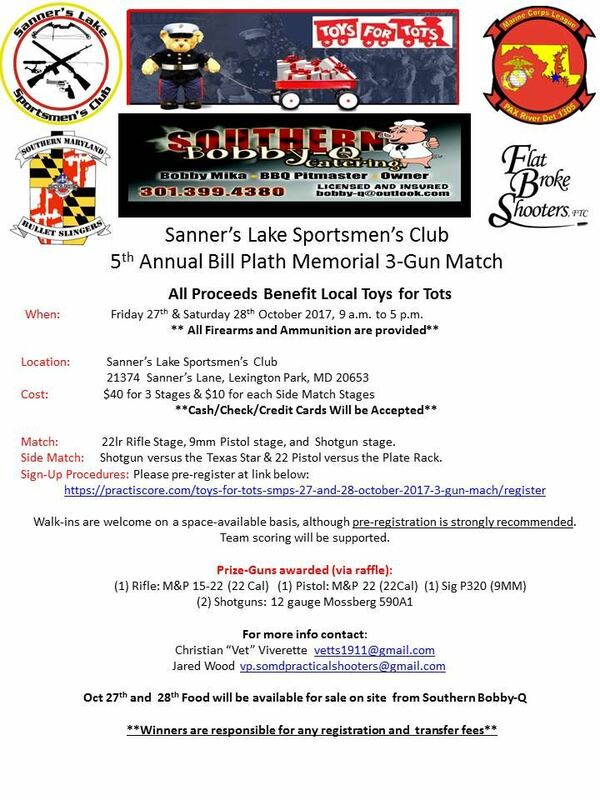 Another hugely successful event for the partnership between SLSC, USPSA program and the Marine Corps League Det 1305. We had over 170 people shoot the event. Lots of new shooters came out and had a great time. We had good help from Sanner's Lake Sportsmen's Club members that signed up and volunteered to work the event. On Saturday Southern Bobby-Q came out and provided food for the shooters and staff and donated to T4T as well. Numbers are still being tallied but we raised lots of money for the local community. Congratulations to Flat Broke Shooters for winning the Small Team competition. Their team consisted of Chris Viverette, Cindi Thomas, Steve Thomas and Jared Wood. The Large Team top honors went to Alcohol to Gunpowder - Mike Haskin, Scott Boas, Kevin Stone, Todd Dillard and Harry Bowling. For the 3-Gun Match Rodney Leeber took first place. He also won the Pistol and Shotgun Stage. Paul Sikora grabbed the top spot on the Rifle Stage. The was some stiff competition on the 12 ga Shotgun Texas Star but in the end Joe Maida took top honors with a time of 3.54 sec. At the .22LR Pistol Plate Rack, Chris Viverette held off the competition to snag first place with a time of 3.16 sec. But of course, the biggest winners are all the kids that will get presents this holiday season due to everyone's generosity in supporting this event. If you'd like to dive down into the results even more go to the practiscore links below. Congratulations to all who won raffles guns. The winners have all been notified.